Last night lying in bed listening to the waves crash against the shore was another experience I will treasure. Barn Hill is situated on Thangoo Station, which is a working cattle station. Alf and Maria Grey purchased Thangoo in 1964. The property is approx. 430,000 acres and stretches 85 kms along the coast between Broome and Port Hedland. The property runs 8,000 head of Brahman cattle which are marketed to the live export port trade through the port of Broome. Yep, another red sand road to drive along! Make sure you close the gates! To keep these guys in. 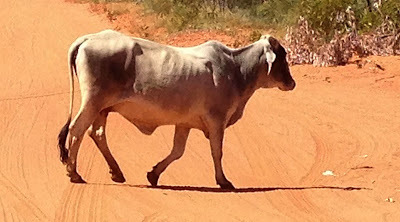 Driving in yesterday along the 10km of sandy road and having to get out of the car and open and close three set of gates that keep the cattle where they are supposed to be, I never dreamed at the end of the road would be such and idyllic location. 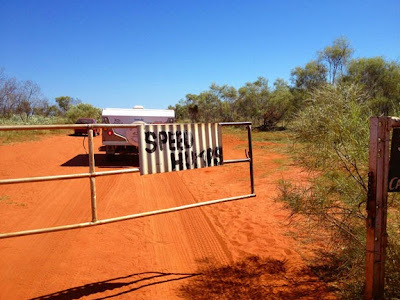 The camp is still pretty busy but as we are getting to the end of the holiday season we are noticing things are starting to quieten down a little. Barn Hill seems to have attracted a lot of campers that have been coming here for many years and stay for quite a long time. One lady I spoke to had been here for four months. Can anyone tell me what sort of birds these little guys are. They are keeping us entertained around our camp, with the males constantly hanging around the girls trying to tempt them with their charms. 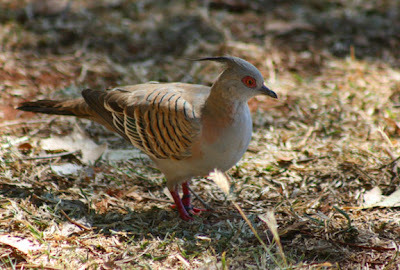 What sort of bird is this? Can anyone help? 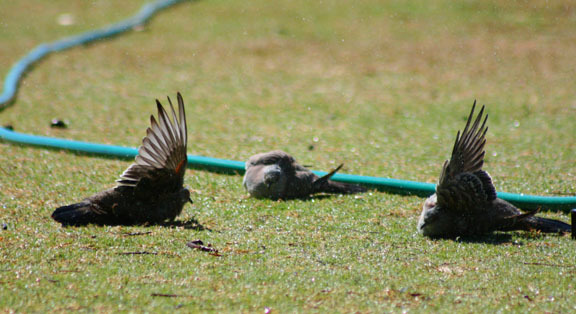 They are so cool how they lay back with one wing up, having a shower under the sprinkler. This morning I decided to go for a walk along the beach that is a two minute walk from Myrtles door. The crashing of the waves and peace and quiet was once again a moment I will remember. 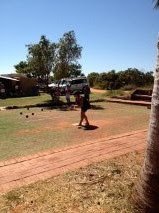 This camp has quite a few activities to keep the guests entertained, one being lawn bowls on a pretty rugged lawn. The long stayers obviously play it regularly and needed a fill in this morning. So guess who got roped in - yep me! Even though I had no idea what to do it turned out to be a lot of fun and our team got into the grand final, but came second. But we got an ice-cream voucher as our second place prize. So I was happy I got an ice-cream. Our day ended with being treated with yet another beautiful sunset. While sitting on the beach looking out at theses amazing colours I didn't know which way to turn. 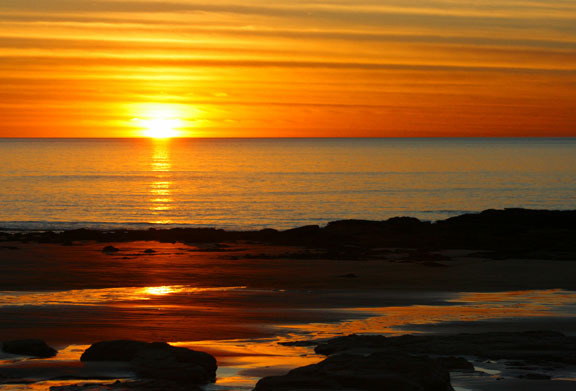 I had this sunset in front of me, the amazing red rocks to one side, an equally amazing Blue Moon on the other side of me, while dolphins frolicked out in the water. Tonight we have been treated with a Blue Moon. Yep I know just another sunset! But look at it! This looks to be a beautiful, or should I say another, beautiful place, Davine. 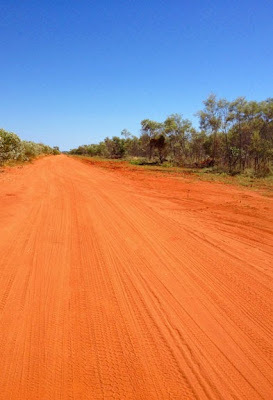 I LOVE the red roads......reminds me of Prince Edward Island here in Canada'''''all the roads are this colour too. I am no 'bird expert' but they look like they could be a type of pigeon maybe. 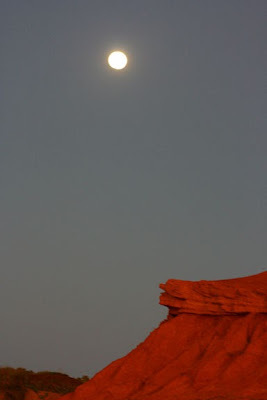 Hi Jim - Yes the red dirt actually gives everything such amazing colour. Thanks Mark - I know the birds having their showers intrigued me.